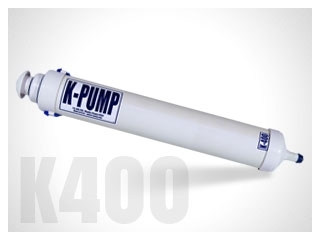 The K-400 is a true two-stage pump. The primary stage delivers a huge volume (approx. 1.3 gals) of air per stroke. When the pressure in the raft increases and pumping starts to become difficult, a simple twist of the handle locks out the high-volume primary stage and locks in the high-pressure "top-off" stage. You won't miss a stroke! Just 5 lbs. and 31 inches in length, the K-400 is sleek and light-weight compared to it's competitors and is constructed of extremely durable UV enhanced ABS plastic to withstand years of use. As with all K-Pump models, the "hose" has been eliminated! A 600 denier "stow-bag" is included for stowage and protection. Also, like all K-Pump models - the K-400 floats!